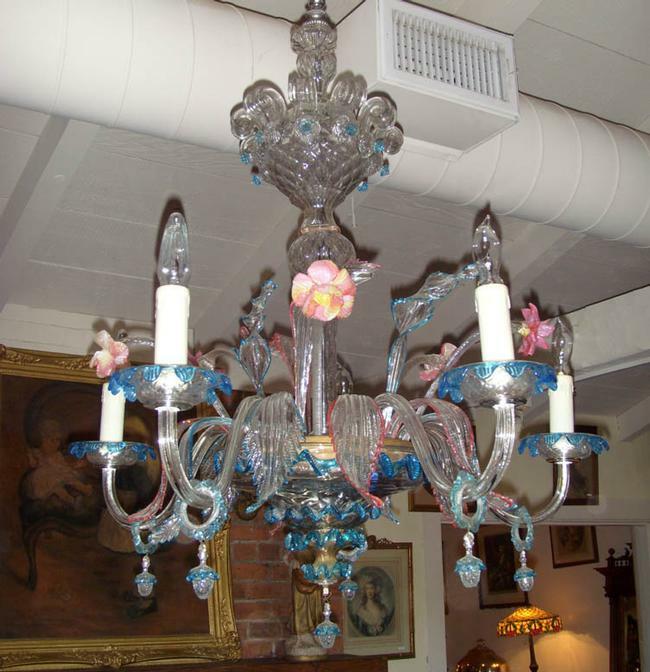 Venetian Chandelier -- Beautiful Venetian chandelier purchased out of New York City penthouse. There are six arms with acorns hanging on the bottom of each. There are pink and peachy flowers, and the leaves have pink or turquoise trim. It measures 42 inches long with a 24 inch diameter. Beautiful Venetian chandelier purchased out of New York City penthouse. There are six arms with acorns hanging on the bottom of each. There are pink and peachy flowers, and the leaves have pink or turquoise trim. It measures 42 inches long with a 24 inch diameter.